Yes, it’s nice to be chef for the day and make everything for Thanksgiving from scratch. But, also, it’s hard. That’s a lot of food, and sometimes you need a helping hand — or don’t feel like cooking at all — but still want a great meal at home. 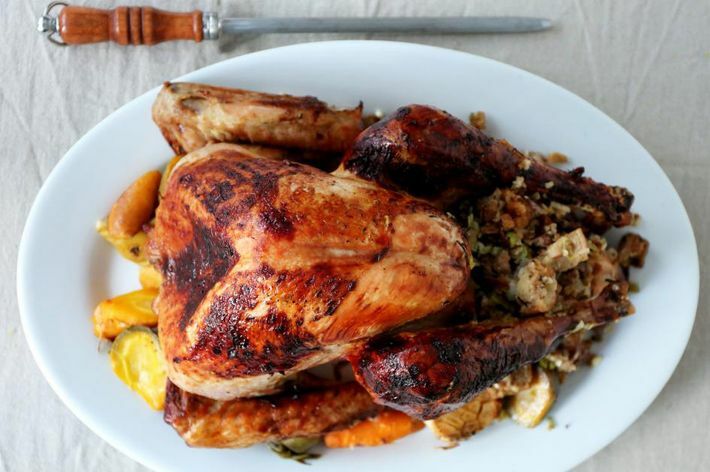 Or maybe you just need a good turkey, and, oh, a few sides won’t hurt. Whatever, Grub is not here to judge. Also, you’re in luck as a New Yorker: Excellent markets and restaurants around town make it their mission to make your holiday easier by smoking turkeys, baking pies, whipping up sides, and taking care of the whole meal for you. At Andrew Tarlow’s general store and butcher, they’re selling pastured turkeys (organic and not organic) for you to roast yourself. If you don’t want to cook anything else, there’s also poultry gravy, potato gratin, sausage stuffing, brown-sugar-roasted sweet potatoes, and cornbread stuffing. Order by November 19, and pick up between November 20 and 24. If you’d prefer to eat at home, MP Taverna will prepare its menu to go for eight to ten people. You’ll get dishes including turkey with gravy, “grandma’s” meatballs with tzatziki, Greek salad, and Greek sausage stuffing. 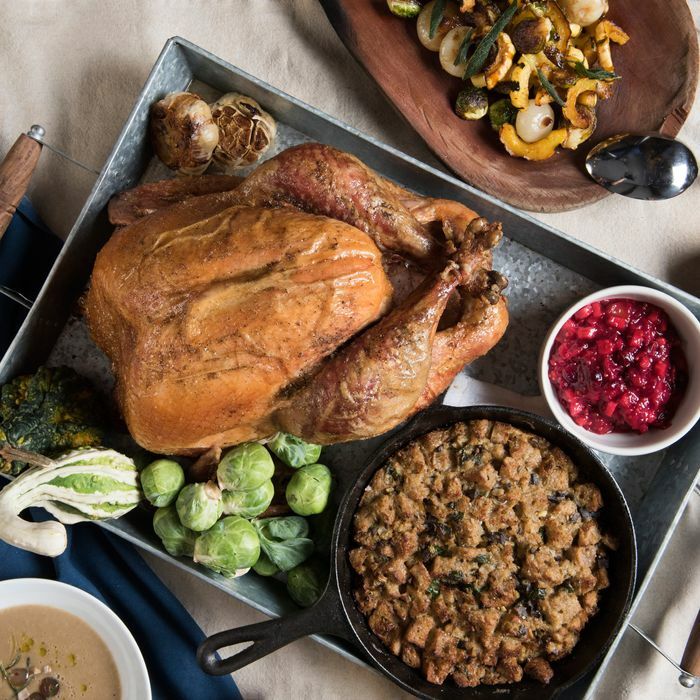 Order by November 14, and pick up on November 24 from 11 a.m. to 6 p.m.
Hit up the gourmet grocer for your roasted turkey, butternut squash, root vegetables, homemade stuffing, Parker House rolls, pumpkin or apple pie, and more. Order by November 21 at 2 p.m., and pick up at November 24 at noon. Get your turkey from Bklyn Larder, where they brine it, roll it, and stuff it before cooking for you. There’s also a ton of sides, like olive-oil crushed potatoes and cauliflower gratin, platters of cheeses and dips, three kinds of traditional pies, and much more. If its smoked meats you’re after, look no further. The Montreal deli is offering smoked turkey breast and drumsticks, along with braised brisket, plus sides like green beans and chermoula topped with fried onion and conflict garlic mashed potatoes. Price: Ham is $16 a pound, turkey is $6 a pound, and sides are still being priced out. The Bushwick market will sell housemade hams, whey-fed pork, and turkeys for preorder, as well as sides like mac and cheese and squash purée. There will be special cheeses in, too, like Comté Sagesse, Rush Creek Reserve, and Vacherin Mont D’Or. Preorders will be accepted either until they sell out or a week before Thanksgiving. Danny Meyer’s barbecue spot will make you sweet-potato mash, green beans, biscuits, pie, and turkey breast. Order by November 21, and pick up through November 24 from 9 a.m. to 1 p.m.
At David Chang’s second restaurant, they happen to know a thing or two about large-format meals. So put your trust in them, and get a whole-roasted pork shoulder with bibb sauce, napa kimchee, and pork gravy, plus sweet-potato purée with BLiS maple syrup and roasted marshmallow, turkey buns, apple pie, and more. Order by November 20, and pick up on November 24 between noon and 3 p.m. The southern restaurant will offer its family-style Thanksgiving dinner both in house and to go. Your haul will include turkey and gravy or country ham, traditional or oyster stuffing, green-bean casserole, cream onions, and roasted sausage. Sweet-potato pie is the default dessert, but you can pay a little extra to get pecan pie or pumpkin-spice layer cake. Check out the new café attached to the relocated Union Square Cafe, and still eat at home. You’ll get rotisserie turkey and pan gravy, rosemary-walnut oil, cranberry mostarda, turkey-giblet-mushroom stuffing, whipped potatoes, and more. Order by November 21, and pick up on November 24 between 8 a.m. and 2 p.m. The sandwich masters at Court Street are preparing a whole slew of dishes to help beef up your Thanksgiving spread. There’s Martin’s bread and Edwards and Sons sausage stuffing, turkey-giblet gravy and pressed-turkey-thigh confit, cranberry-apple relish, and much more. Along with fresh capon, duck, and turkey, the Williamsburg meat freaks will sell smoked turkeys, available for pickup on November 23, and their house ham, available for pickup starting November 19. April Bloomfield’s brand-new butcher shop and restaurant will celebrate its first-ever holiday with turkeys and much more. Sides include pan-jus gravy, pumpkin with sage and candied seeds, mashed potatoes with nutmeg, and cranberry sauce with citrus. The modern Chinese-American restaurant will offer its Peking turkey, sold only for Thanksgiving, for pickup. The bird comes with condiments, crêpes, and sweet-potato tempura. Order by November 21, and pick up at 2 p.m. on November 24. One of New York’s best pie spots, the Williamsburg shop will stick to its mostly classic routine. Flavors include traditional apple and apple-cardamom crumb, as well as pumpkin, molasses-rum pecan, and more. If you have your hands full with the savory side of dinner and need dessert covered, Marlow & Sons can lend a helping hand. They’re making spiced pumpkin-and-squash pie, thyme-and-apple pie with streusel, bourbon-pecan pie, and a malted-milk-chocolate tart. Order by November 17, and pick up on November 23 or 24. The Gowanus pie fiends are offering their classic salted-caramel apple pie, as well as salty-honey, bittersweet-chocolate pecan, and brown-butter pumpkin pies. Orders taken until supplies run out; pick up on November 22 through 24. Introduced last year, this Ample Hills collaboration with Four & Twenty Blackbirds unites ice cream and pie in one dessert. Frozen salty honey custard pie is topped with fudge, sea salt, and Nonna D’s Oatmeal Lace ice cream, then extra fudge and pieces of crack cookies. Pick up at any Ample Hills location from November 18 through 23.